The December issues of men’s adventure magazines rarely featured Christmas-themed covers. I suppose it was hard to mix rugged manliness with sentimental seasonal cheer. But there are some that managed this combination beautifully. One example is the cover of the December 1948 issue of True magazine. 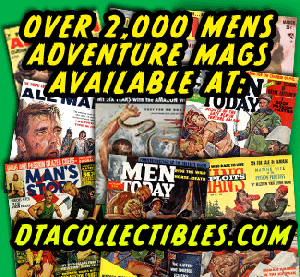 True, published by Fawcett Publications for most of its long run, was one of the more upscale and mainstream men’s adventure magazines, along with Argosy and Saga. It was first published in 1937 and continued until 1975. The superb cover painting on the December 1948 issue is by Tom Lovell (1909-1997). Lovell was a New York artist who particularly liked Western subjects. Eventually, he focused primarily on Western-themed paintings and moved to New Mexico. The cowboy bunkhouse Christmas scene he painted for the cover of the December ‘48 issue of True manages to be sentimental and manly at the same time. 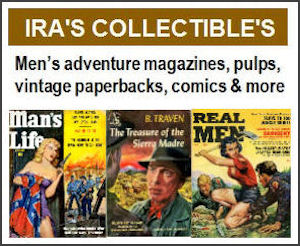 But lest you get any funny Brokeback Mountain type ideas, note that the subtitle of True at the time was “The Man’s Magazine.” Which didn’t mean “girly man,” bub. No, siree. 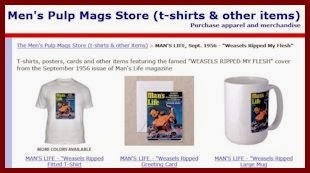 This subtitle was changed to the “#1 Man’s Magazine” in the 1960s. And, indeed, in its heyday, True’s circulation exceeded one million copies. *Referring to Martin Goodman, owner of the Magazine Management publishing house. As Friedman notes, Argosy — like True — was a top-tier men’s adventure magazine. 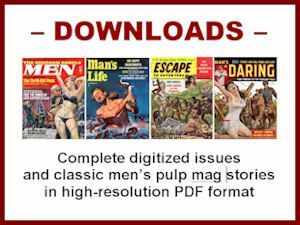 It began as a classic digest-sized pulp mag in 1882, more as a boy’s magazine than a man’s. Over the decades, it “grew up,” both in size and content. 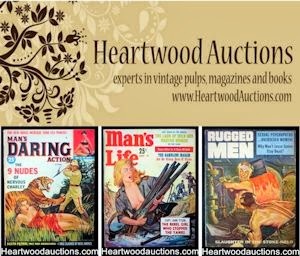 It went to normal magazine size in 1941, and focused on an adult male audience that liked adventure, action, war stories and hunting topics. Argosy used painted covers until the 1960s, then switched to photos. The two Argosy covers below are from December 1963 and December 1964. They each feature a highly creative, painterly Christmas-theme photo taken by photographer Arie De Zanger. At the risk of seeming unmanly, and politically correct and incorrect all at the same time, I wish those of you who are reading this blog Happy Holidays, Merry Christmas, Happy Hanukkah, Happy Kwanzaa and Happy New Year!